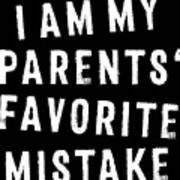 There are no comments for Favorite Child My Parents Favorite Mistake Grunge. Click here to post the first comment. Funny gift idea for your son or daughter on their birthday, or as a gift for the baby on a baby shower or sip & see party. 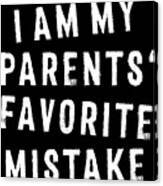 The distressed type says "I am my parents' favorite mistake" in a grunge effect. Baby shower gifts for girls or boys: This funny t-shirt is perfect to show you are mom's or dad's favorite child. Even if you were a "mistake" you are still loved! 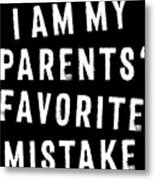 Funny quote variation to a "favorite child" gift idea to give to your children.